Apples are so versatile and basically they are used in baking and as some of you know, a baker I am not. I decided to do one of my Latin spins and I must say that it has never been done and the combination of apples and green plantains was quite delicious. I cored the apple and scooped some of the flesh, stuffed them with mofongo mixture and baked at 350 degrees for about 30 minutes. Please visit my Mofongo post for instructions on how to make this Puerto Rican traditional dish. This time I used pork belly instead of pork rinds and the addition of chopped apples. 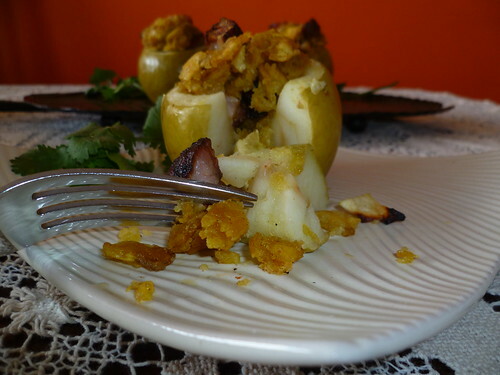 This entry was posted in Apples, Fruits, Latin Contemporary, Mofongo, Uncategorized. Bookmark the permalink. Ooh … apple mofongo … I can almost taste all that garlicky, porky goodness with the sweetness of baked apple. Really cute presentation too. Love your spin on this apple dish! Looks very flavorful! It tastes as good as it looks Norma!!! You are all so creative! 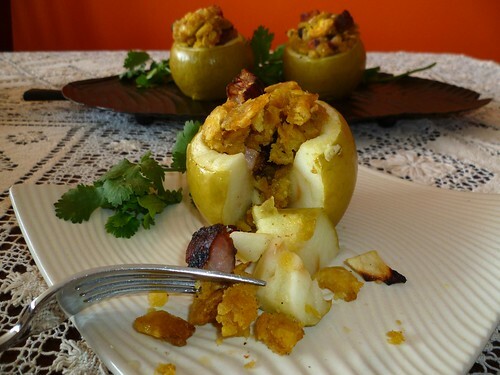 Se las añadi crudas al mofongo y despues el puerco y rellene la manzana con la mezcla….. I have never had apples prepared this way…fascinating! Looks delicious, Norma! I’ve never baked apples like this! ooh, apples seem like such a great addition to mofungo! Wonderful! I’ve never had mofongo, but I’d gladly try yours. Oh love plantains but never prepared them myself. I can just imagine how wonderful it is with apples like this. 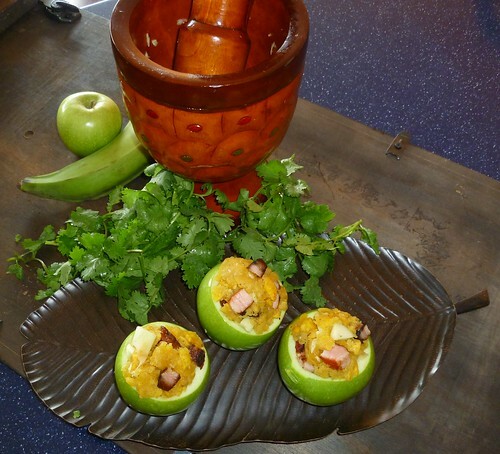 I love mofongo, and I am thinking this may be a way I would actually like apples!! 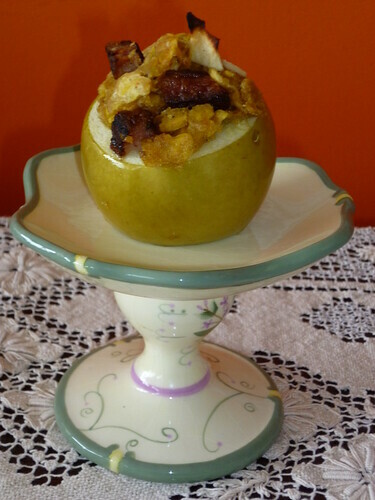 Yum, the apple mofongo with pork belly sounds excellent indeed! Qué cosa más rica Norma…!!! Nunca me hubiera imaginado rellenar una manzana con mofongo. Se ve exquisito. Tengo que preparar esta receta!!! Pork belly and apples, way to go Norma! Sounds delish! I did have to look up Mofongo since I had no idea what it was! Wow what a flavor blast and brilliant to put in an apple. I can see this as a heavenly side dish to a big pork roast. Great spin on apples!!! Thanks Deana it was really good…. I love the savory with apples, and your Latin spin is always welcome. I know it’s childish, but I just can’t say the word “mofongo” without laughing! With that said, the combination of flavors sounds delicious (I love pork and apples together). We have to get some mofongo the next time I’m in NYC! I will make it for you!!! !